Derek was my cousin. To be precise, he was the eldest of the Van Buerle cousins. Both of us were born in Malaysia, and I guess Derek has been around my life forever. We were not the type of cousins that saw each other often. My Dad worked for the United Nations so we lived wherever the UN sent us. A a child I would see Derek when we went on home leave to Singapore. The visits were every two years. In between those times we’d correspond occassionally. Derek’s Dad, my Uncle Harry, also used to write and send me first day covers of stamps issued in Singapore. At about 16 Derek was sent to Australia to finish school. I was at boarding school in Beirut at that time. We continued to stay in touch, but not as often, as by this time Uncle Harry and the rest of the family had settled in Perth. Eventually, in 1981 I came to Australia and made Darwin my home. Derek, footloose and fancy free, came to visit, driving up from Perth. In Katherine he became very ill, I think it was pleurisy – but my memory is not the best – whatever it was, driving was very painful for him. We ended up driving down to bring him up to Darwin. Derek liked Darwin, got a job and remained in the Territory for a while; we became closer once again. It was nice getting to know each other better as adults. We used to take turns cooking and I have fond memories of Derek pouring through my stack of recipe books deciding what to cook. He was always up for trying something new. Derek learned to scuba dive while in Darwin, then headed off to the Barrier Reef for a diving holiday. Sorting through a box of stuff the other day, Cheryl and I came across this postcard dated 1987 that Derek had sent to us all. One holiday let to another and he ended up back in Penang, where he met the woman who would become the love of his life – Maree – and mother to his three beautiful daughters. Over the years, we didn’t see each other very much. I guess our lives got busy with kids and work. I caught up with Derek and Maree in Canberra and in Sydney, and there was the odd phone call and letter. As cousins, we were all reunited three years ago, when my Uncle Harry, Derek’s Dad passed way in Perth. It was at the funeral. Derek had a bad cold, but was looking forward to going on a cruise with Maree in a few weeks. The cruise was not to be. Maree called – Derek had been to the doctor. Leukemia. Derek underwent treatment and many of the Van Buerle family members were tested for suitability as a donor for a bone marrow transplant. During this time, we stayed in close touch. I guess we were all reminded of the fragility of life, the preciousness of family and how fast time flies past. It brings into focus what is really important. By this, Derek meant that he was going to be reunited with his Father in Heaven, and would be leaving this earthly life. Treatment options were exhausted. Time was running out. But Derek, in his own way, had made his peace with this world. He had his Christian faith and was unafraid of death. As we finished our chat, I promised to visit. Soon. Together with my cousin Cheryl, I flew to Melbourne a couple of weeks later – 2nd of April. Cousin Michael, who lives in Melbourne also joined us. Derek was frail and skinny. But still the same old Derek and so thrilled to see us all. We laughted, we talked about death, we talked of childhood memories, we drank champagne and looked at old photo albums. 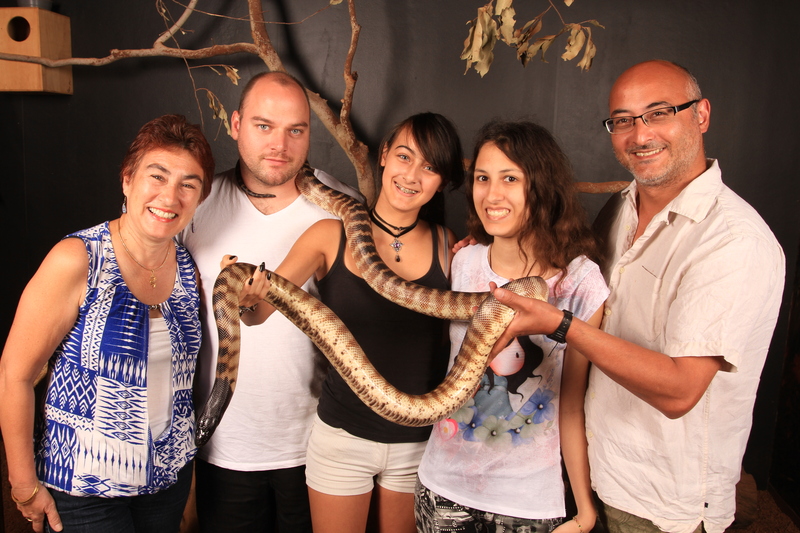 We spent a very happy couple of days with Derek, Maree and their three lovely daughters. As we said goodbye, I knew I was unlikely to see my cousin again in this life. But he was content and at peace with the journey ahead of him. The end came faster than expected. Derek passed away last night at 7.15 pm. Vale Derek – you’ll always be my eldest cousin that has a special place in my memories. Yes! I’m still alive and kicking! Thanks to my followers for being in touch and asking me how I’m going. I find it hard to believe that it’s been a couple of months since my last post here! I forget that not everyone has Facebook to keep up with the news as I post it. I’m here in Darwin still, but had a quick trip to Brisbane to catch up with my godparents (Allen & Rose Jagger) when they were in Australia. It was wonderful to be able to spend almost a week together – been so, so many years since we did that. In fact, I think it was when I was at Rishworth! Not enough time to catch up with friends, but I hope to get back that way in May and catch up with all friends then. On the home front, I still keep busy with the gardening – never ending trips to the dump with all the palm fronds. They might seem exotic trees to others and look like low maintenance, but they are a pain! On the plus side, Molly and Janie are always up for a trip and love going out there for a drive. Janie & Molly just love a ride in the ute! Really exciting news is that two of the books I’ve been working on with clients are published. One has hit the best seller list in its category. I do enjoy editing, as it combines my love of reading and English skills. Who would have thought that it would lead to this? Sasha and I have just finished working on the edits of a biography for an Australian client. It was nice to collaborate together and the book is currently doing the round of publishers. Once again, because of confidentiality, I am unable to reveal titles or authors. The Dry Season is finally arriving, so walking around Darwin is once more very pleasant, as opposed to the hot, sticky humidity that’s been greeting me for the last 6 months! Given I’ve got so many overseas followers, I’m going to start a regular weekly update to inroduce you all a little more to Australia, and I’ll be starting with Darwin. That’s all for now folks. It’s girls night so Sasha and I are about to kick back and relax with the latest Season of Game of Thrones! This time last Sunday I was in Ecija, having breakfast with Anne and Miguel plus the gorgeous Hugo who is growing up so fast! My quick trip to Spain last week came out of the blue. Although it was a very short trip, there is always an upside to everything. Having a great friend who dropped everything and drove me to Darwin Airport, plus came armed with a thoughtful E200 in cash so I didn’t have to worry about changing money immediately I landed. A lovely opportunity to catch up with former colleagues (Myriam, Juana and Anne) who have become friends. Palace of the Christian Kings (Alcazar) by night. An opportunity to see Cordoba by night. It is truly magical and totally different from the day time. Plus there are less tourists at this time of year too! A chance to practice my Spanish, to eat jamon and beautiful olives. Life is funny, we never know what each day will bring us in terms of both challenges and opportunities. Being appreciative of our families and special friends is so important. I am blessed to have wonderful, caring friends right across the globe and a fantastic family. I’m also really fortunate to have a profession that means I can work while on the move! Christmas – a global marketing feast! If there is one holiday in the world that has a sweeping impact on everybody, it has to be Christmas. What unifying theme inherent to Christmas makes it one of, if not THE most awaited time of the year? This seems to be true regardless of race, social background, creed, or religion. Is it the extravagent meals, the parties, or the family gatherings that make this holiday so special? Dare I say it just might be the outrageously priced presents and the spirit of giving and receiving that has created such a global buzz – in other words commercialism! Very, very clever marketing tactics. In fact, quite brilliant – just about everyone buys into it! Whatever it is, no one can deny that Christmas is the most expensive holiday there is, and many are saying (quite rightly in my opinion) the true spirit of the season has been missing since retailers started to realize the money making opportunities Christmas can offer. Food for thought – many have been complaining about how Christmas mutated into a crass, and wantonly commercialized yearly event way back in the late 1800’s. While it is untrue that the Victorians came up with this holiday, they are credited for having “invigorated” it. From what used to be a solemn family occasion, manufacturers, shop owners, and industrialists cottoned on to the fact that Christmas had the potential to be turned into a profit maker. In the quest to drive profits higher, entrepreneurs found innovative ways to get the cash registers ringing well into the 21st century. Today we see Christmas decorations and hear holiday carols playing in the background since November, or in some cases even earlier – drives me nuts! Let’s dive a little deeper into how it all started. Perhaps by doing so, we can understand how it’s got to this ridiculous point. At the turn of the 19th century, when shop windows start displaying hand-painted Christmas cards, it signaled the start of the holiday season. A great way to remind people to buy the Christmas cards for friends and family! Then there were the department stores who created a whole new Christmas tradition – obsessive and excessive shopping. Case in point, JP Robert of Stratford was the first to incorporate a Santa for the children to visit. It was the perfect marketing ploy! A mother would bring her child to the shop knowing it would be fun and exciting to the child. Similarly, Gordon Selfridge coined the phrase “only X shopping days left to Christmas,” and made sure his department store – Selfridge’s – was at its most glamorous to tempt shoppers to come to spend their money. Even during the outbreak of World War II, although austerity measures dampened Christmas buying, it never came to a grinding halt. By the time rationing ended the British actually encouraged everyone to go on spending sprees. It doesn’t take a historian or an economist to figure out that Christmas has been well and truly commercialized for a very long while. It is far worse today, with easy access to credit cards, online shopping, Boxing Day sales and so much more, all designed to part us from our money. In my book, the true gifts at Christmas are the presence of loved ones, not the presents. Sure, gifts are nice, but they are not the be all and end all – unless you’re a small child and even then, they do not need to be madly expensive! My most favourite memories are of the build up to Christmas Day. The tree used to be a live one that went up in time for my birthday (Dec 23rd), Mum would always make me a chocolate cake and that was the start of Christmas for us. This year, for the first time in a very long time, I’ll have all my family here with me for Christmas, all us siblings, Mum, Dad, nieces and nephew. There won’t be massively expensive presents, but there will be a whole lot of love and that’s what the true spirit of Christmas is to me.